In just one month in 2016, eight barn fires in Ontario killed nearly 53,000 animals. Campaign manager with Humane Society International/Canada. Firefighters battle a barn fire near St. Thomas, Ont., Feb. 1, 2016. Ontario Provincial Police said approximately 90 dairy cows died. While Canadians have been fixated on the wildfires out west, other, less reported fires have been raging across the country. Persistent yet preventable barn fires are causing unimaginable suffering and death each year for hundreds of thousands of animals trapped inside these burning facilities. On Aug. 10, a tragic fire claimed the lives of approximately 4,000 pigs, when a large barn at a farm in Warwick Township, Ont. went up in flames. On August 1, an estimated 1,000 piglets died in a devastating fire in Oxford County, Ont. Mere weeks before that, approximately 10,000 chickens were killed in an horrific factory farm fire in Abbotsford, B.C. Alarmingly, nearly 18,000 other chickens died in a fire at the same facility five years earlier. It is hard to fully comprehend the enormous scale of pain and desperation felt by these intelligent animals as they struggled in vain to escape the burning flames and smoke. What we do know, however, is that in the case of most barn fires in Canada, simple fire prevention methods could spare thousands of animals from senseless suffering. Terrified farm animals often burn to death, while those who manage to escape may suffer respiratory problems and other complications from excessive smoke inhalation. 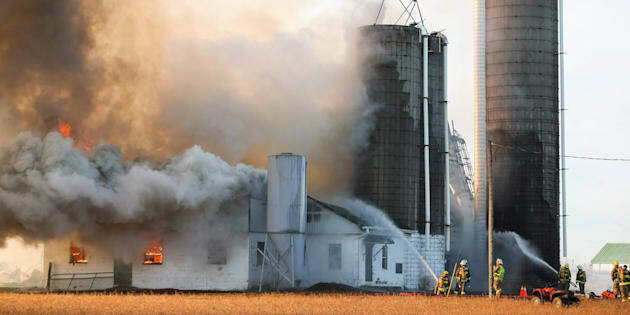 According to the Ontario Ministry of Agriculture, Food and Rural Affairs, some of the leading causes of preventable barn fires are mechanical and electrical failures, deficiencies in facility design, construction or maintenance, or the misuse of the material or equipment that first ignited (space heaters, blow torches or extension cords, and the location of hay, for example). These factors are compounded by the ever-increasing size of modern-day commercial farms. In Ontario alone, there are well over 100 barn fires each year, resulting in millions of dollars of damage. Terrified farm animals often burn to death, while those who manage to escape may suffer respiratory problems and other complications from excessive smoke inhalation. A barn burns in Quebec City, Que. In just one month in 2016, eight barn fires in Ontario killed nearly 53,000 animals. Yet the National Farm Building Code has remained unchanged for over two decades, failing to keep pace with the large-scale farm operations characteristic of today's agricultural industry. Without these safety features, undetected fires spread rapidly, and by the time a fire is detected and first responders arrive, it is often too late. Fires of any size unnecessarily put first responders in harm's way, while large blazes leave rural communities with limited emergency response resources extremely vulnerable. As farm operations are increasingly centralized and weather patterns become more extreme due to climate change, the already-horrendous impact of barn fires on intensively confined farm animals will become even more apparent unless we take action. In addition to installing basic safety features, farm owners and operators should also adhere to best practices such as annual fire safety inspections with their local fire departments, regular fire drills and implementing fire safety plans. These simple yet urgently needed measures could prevent many of the fires that tear through Canadian factory farms each year, saving countless farm animal lives from unspeakable suffering. It is time for the Canadian agricultural sector to finally take barn fire prevention seriously. As farm operations are increasingly centralized and weather patterns become more extreme due to climate change, the already-horrendous impact of barn fires on intensively confined farm animals will become even more apparent unless we take action. For a nation struggling to retain access to foreign markets with substantially higher standards of farm animal welfare, ensuring that farmers are following the latest recommendations on fire prevention must be an urgent priority.